When I visited my sister Anne this past spring, she brought out our mother’s look-a-like doll. 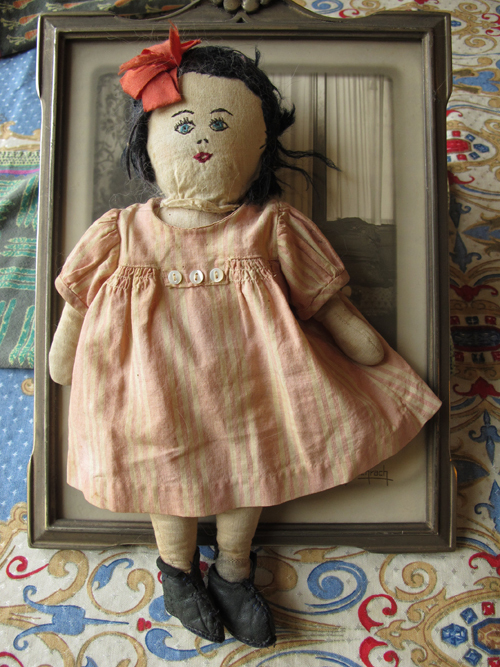 Mom’s doll was made by our great-aunt, Alma Salley. Here’s a picture of Mom with her father in the early 1930’s. Mom described him as a kind, gentle man and I love seeing photos of them together. We never knew him, as he died before his grandchildren were born. Anne and I remember receiving exquisite doll clothes made by Alma when we were young. We didn’t see our Salley relatives very often, as they all lived in South Carolina and we were in New England. 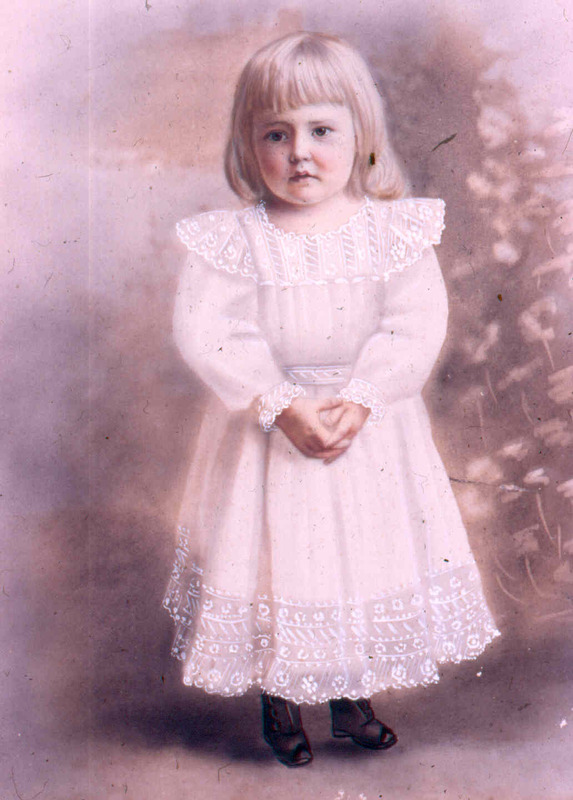 This is an old painted photo of Alma, who was born in the 1880’s and lived through a lot of changes, well into her 90’s. 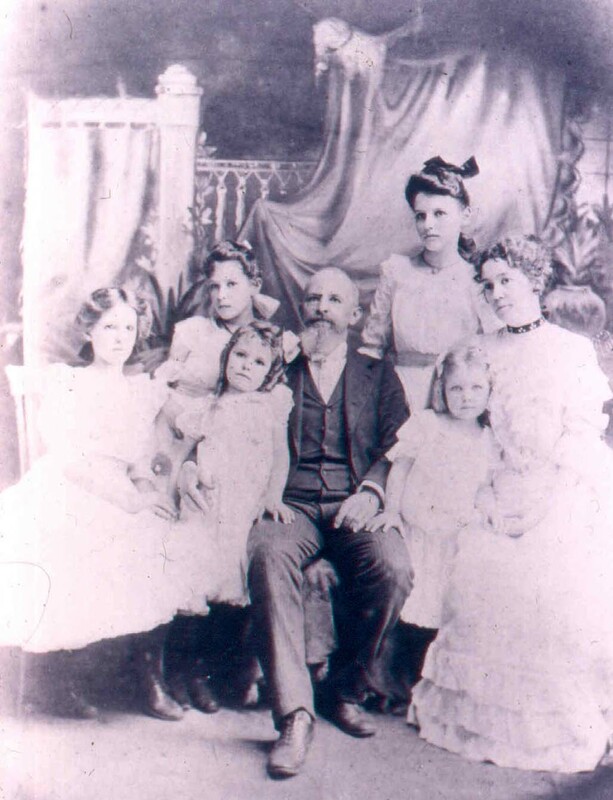 This photo shows my great grandparents and their five daughters. My grandmother, Louise (second from the left), was the only one who left the south. After 8 years of courting, she finally gave in and moved north to Rhode Island, to marry my grandfather. By that time, she was 35 and he was 45, old newly weds for their era, but common by today’s standards. The “Salley girls” were famous in Orangeburg, SC for their spirited independence and all five of them went on to graduate from college. Even though there weren’t any males to carry on the family surname, subsequent generations have several first named Salleys, like myself. We are descended from Henry Salley, who came to America along with a group of other French Huguenots who founded Orangeburg, South Carolina in the early 1700’s. This entry was posted in Doll Collection, Dolls, Family by Salley Mavor. Bookmark the permalink. How wonderful. I love the old photos and you are so fortunate to know of the history of your family. I’m just now, among many other things, delving into genealogy. So exciting. thanks for sharing. have a good one. What wonderful pictures and stories… how often these days we see old photos with no clue as to who or what they’re all about. This was such a treat. What a goodlooking family!!! Very interesting, thanks for sharing. Wow, what a great story. I love the old photos. My ancestors came here many generations back, too, from England, Scotland, Sweden, and we don’t know where else. Finding out is on my to-do list. No wonder you like to sew… There seems (seams?) to be a strong fabric/textile connection between the French Huguenots who dispersed around Europe following the Revocation of the Edict of Nantes (1685) and took their lace making and embroidery mastery with them. I have an operating theory that these kinds of skill sets and interests travel through families, because of the ways parents and grandparents spend time with their children, passing the knowledge along. These were neat to see. Have a great weekend! Thanks for your history lesson and comments. Yes, there definitely is a strong tradition of needlework in the family that’s been passed down through the generations. As Always Salley, You made my Sunday, so much more interesting..
what a fun post! beautiful pictures. Interesting that one salley girl went north…i imagine it caused quite a stir. being from virginia i know that was not always looked on favorably by southern ladies and gentleman of that era! Yes, I have my grandfather’s letters to my grandmother and it’s clear that she was very reticant to leave her family in the south. This doll is gorgeous and I love family’stories . So interesting to read about your family history, especially about the other Salleys, spelled the same way and everything! How very wonderful! I am a southerner myself. We live in my great grandmother’s home on the family farm. I love seeing you post. Have a very wonderful week! What a lovely post! 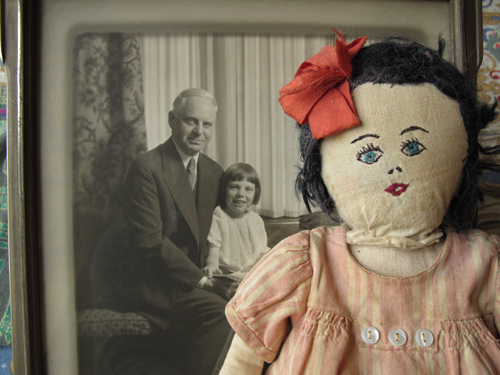 Gorgeous family photos and a charming doll. You are so fortunate to have these things in your life. Thank you for sharing. Thank you for sharing a piece of your family history, and the lovely photo’s of your ancestors. Touching the past always seems a bit magical to me. Beautiful picture…..5 Girls! I’m one of 5 girls too. They look like the family that Louisa May Alcott wrote about in “Little Women”!